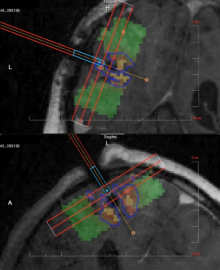 MRI guided laser ablation or laser interstitial thermotherapy (LITT) is an innovative and minimally invasive treatment for brain tumors, epilepsy, and other brain lesions. This treatment involves computer-assisted placement of a laser probe into the brain and delivery of heat therapy. During the treatment, the patient is in MRI for monitoring of the margins of heat delivery. 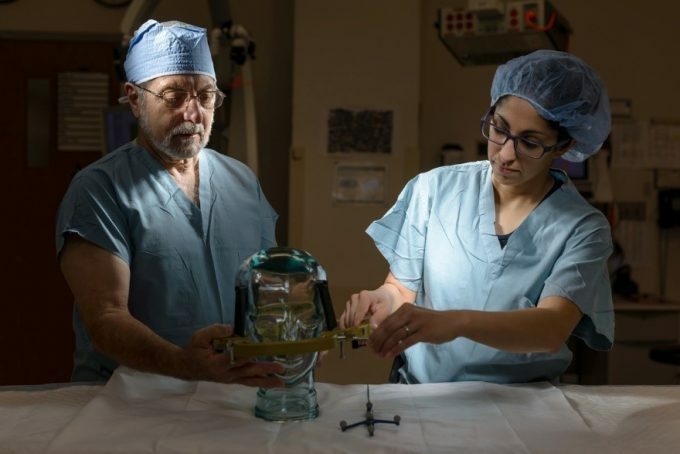 LITT allows for minimally invasive treatment for deep brain lesions. Most patients are treated without general anesthesia and are discharged home the day after treatment. Dr. Bova (left) and Dr. Rahman (right) demonstrate placement of a headring and laser probe as used in the LITT procedure. The laser probe tip can be seen in light blue figure above, and the resulting heat therapy visualized by the heatmap. LITT can also be combined with other novel therapies and has lead to exciting new trials for brain tumor patients at the University of Florida lead by our neuro-oncologists (Dr. Tran and Dr. Ghiaseddin).